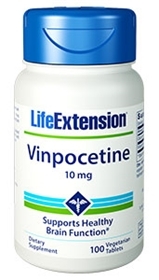 Vinpocetine is derived from vincamine, the major indole alkaloid of the periwinkle plant. No toxic effects have been seen from vinpocetine use at levels far above those recommended for this product. Improve blood supply to the brain. Increase oxygen and glucose use by the brain. Improve brain tolerance to hypoxic injury. Increase vasodilation response to hypoxia. Maintain optimal energy of healthy brains. Maintain normal coagulation of blood. Maintain healthy levels of some neurotransmitters. Promote healthy attention, memory and concentration.